Senior Chace Russel (farthest to the right) crosses the finish line at the state tournament on February 17. Like Eckstrom, Fassett-Carman went into the state race hoping to have a fun end to the season. “I am just hoping to have a really good race, and if that happens, I will be okay with whatever place I end up in,” she said. Last year, Fassett-Carman didn’t qualify for the state tournament, finishing 16th overall individually when it is necessary to finish in the top 11 to qualify. So this season, she came in with the goal of making it to state and secured her state tournament bid by placing fifth in the sections meet on February 8. Similar to Fassett-Carman, this year was Eckstrom’s first year going to state. She started skiing on South’s team as a freshman after skiing all her life. 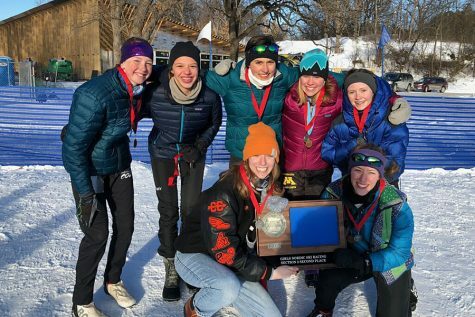 Eckstrom has always wanted to go to state but it wasn’t something she was working up to all season. 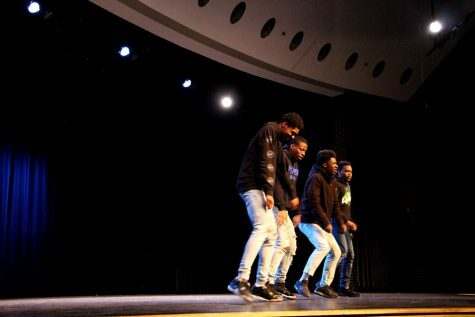 Though state was always in mind, “[doing well at] sections was the goal,” she said. Russel, in contrast, had never skied before his sophomore year. He was convinced by friends from his track team during his freshman year to cross country run and ski the following year. “I’d never seen someone fall down so much when they were learning, but he just refused to not go fast,” commented Eckstrom about Russel learning how to ski. Russel certainly learned fast, qualifying for state individually his junior and second year of skiing. He qualified again this year, finishing fourth at sections. 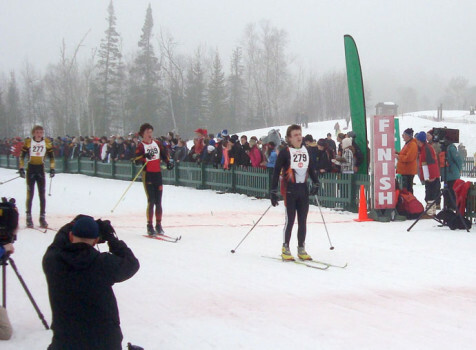 The state race was Thursday, February 17, at Giants Ridge in Northern Minnesota. The temperature was in the low forties and a light mist was falling, making conditions worse. Like most ski races, it consisted of five kilometers of classic skiing and five kilometers of skate skiing. After not preforming as well as she hoped to in the skate race and placing 89th overall going into the classic race, Fassett-Carman passed thirty-seven people and finished 52nd overall, out of 117 women skiers. Eckstrom finished 97th and Russel finished 71st, out of 119 men skiers.